We are having an issue in first and second grades. Maybe not a major issue, but in my brain, and in the brains of my kiddos, it is pretty significant. At least once a day, and I'm lucky if it's less than five times a day, one of my students comes up to me and says, "___________ says he's/she's not my friend." You can fill in the blank with pretty much any student, because none of them have been uninvolved in these situations. Mostly this happens after morning recess and lunch recess. And I am just at the end of my rope because I don't know what to do, other than pulling kids aside and saying, "Do you see how this person feels? Will you please play with this person outside next time?" It obviously is not working, as this continues and I continue to get more and more frustrated. 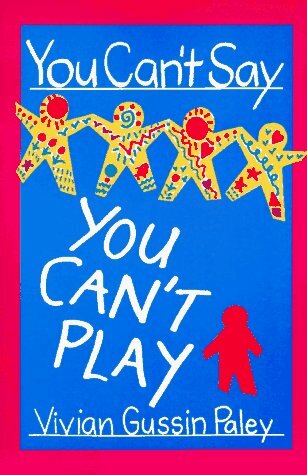 So, I decided to do a bit of reading, and over the weekend I read this little book, You Can't Say You Can't Play by Vivian Gussin Paley. Have you read this, or heard about it? Vivian Gussin Paley was a Kindergarten teacher in the University of Chicago lab school when she wrote this book in the early 90s. She saw what I see - kids getting rejected by other kids during play time. After an incredibly long process, which she detailed heavily in the book, she and her students created the You Can't Say You Can't Play rule. It's pretty self-explanatory - if a kid asks you if he can play with you, you have to say yes. I'm thinking this might be something that I should try out in my room because we are having some overactive tear ducts (and I feel like I'll be one of those criers soon). Do you have a policy like this in your school or classroom? What are your thoughts? I'm a school psychologist who is in love with this book, and looking to intervene in kindergarten classrooms this year. How have you used it? And where do find materials to use it in your classroom? I'm in need of support for this! !